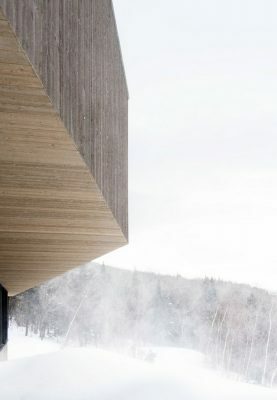 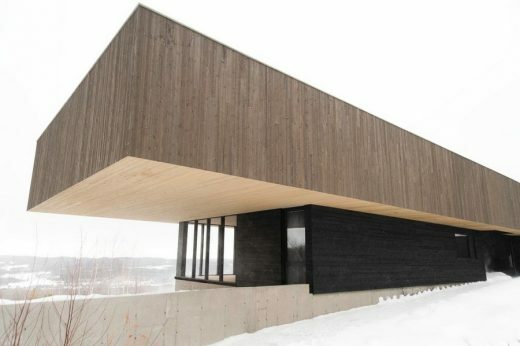 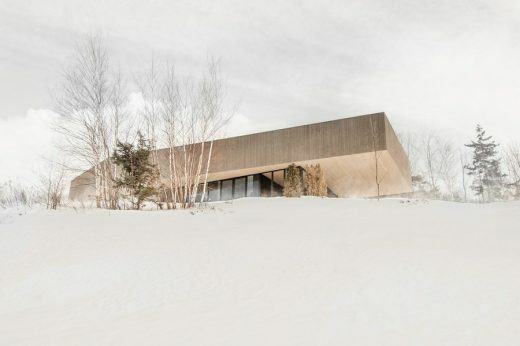 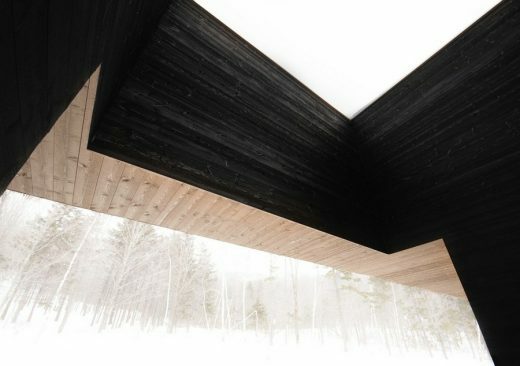 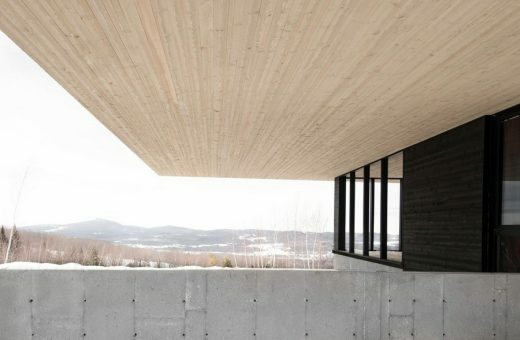 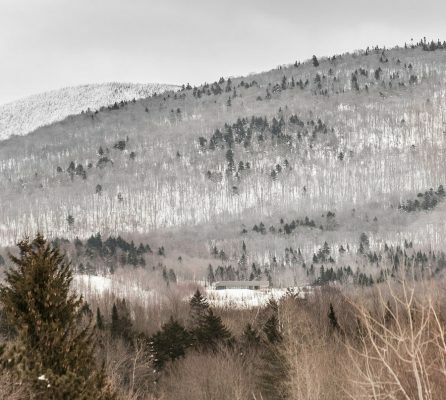 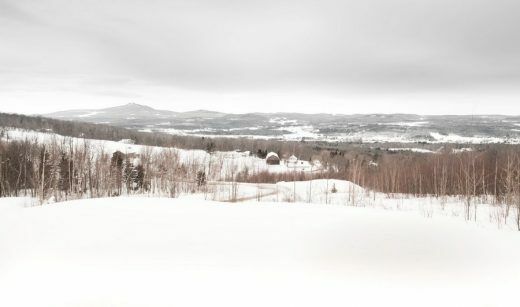 Located outside the village of Sutton, in Quebec’s eastern townships, the Roy-Lawrence Residence is set in a vast estate very much impregnated with the legacy of a Swiss immigrant family that came to Canada in the 1930s. 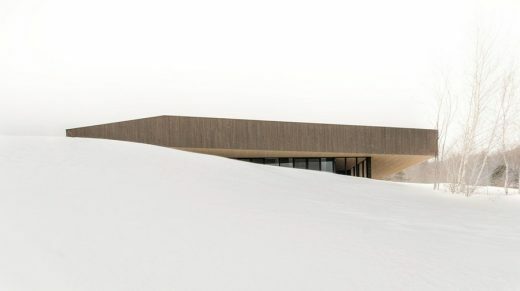 To this date, the surroundings of the residence are still defined by bucolic landscapes, iconic Swiss chalets and other buildings of similar nature that were erected along the years, always with a consistent touch of nostalgia. 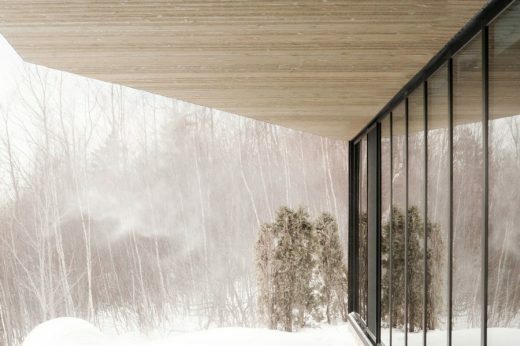 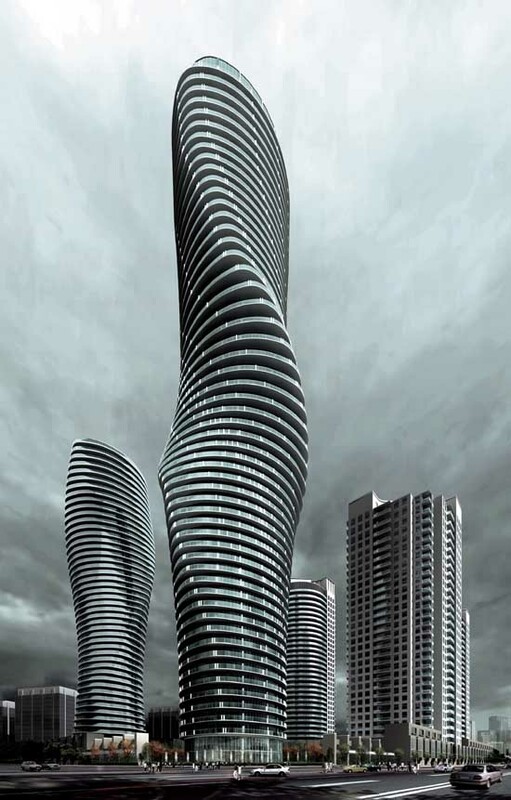 Naturally, the icon of the Swiss chalet, – somehow representing a lost ideal of country living – became the starting point for the conceptual development of the residence. 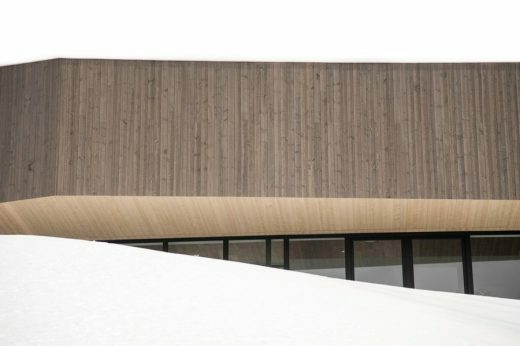 Its traditional tripartite composition consisting of a robust stone base, a solid-wood frame and of a strong protective roof was studied and analyzed in details. 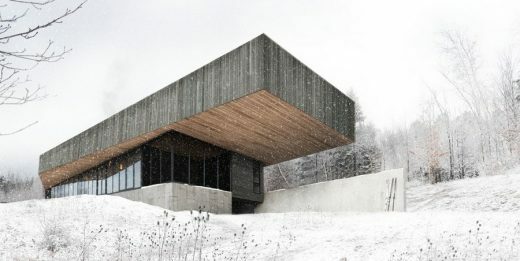 Aiming to reinterpret in a contemporary manner these traditional elements, the final version of residence could be read as a composition of three distinct formal elements stacked on top of each other: a solid concrete base anchored to the rocky ground, a post and beam frame allowing total fenestration on the panorama, and a large protective roof which projects itself into an important cantilever over the garage entrance. 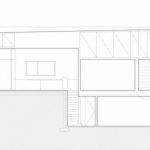 The layout of the interiors were conceived following very simple geographical orientation principles and relied mainly on natural lighting control, dominant wind management and on panoramic views of the scenery on the south west side. 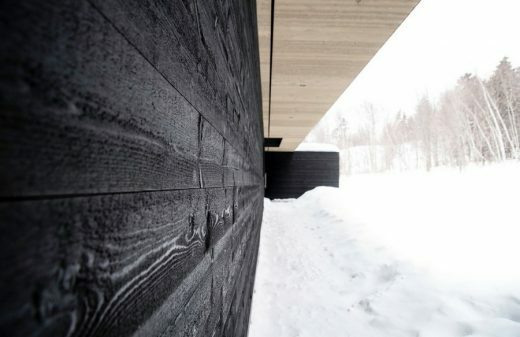 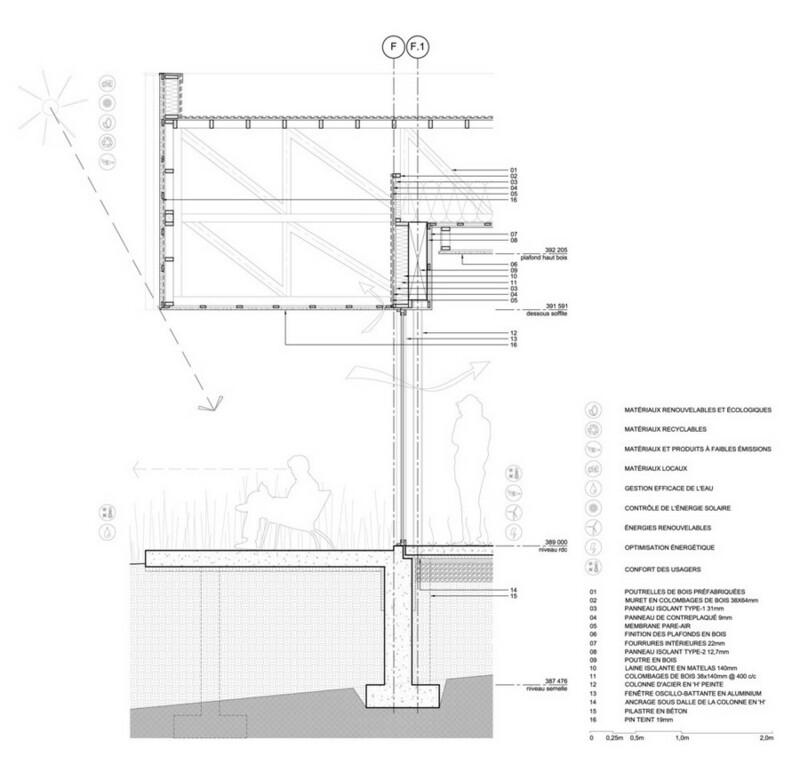 On the north east side, a long wooden wall follows the path leading the visitor to the main entrance which has been recessed towards the middle of the residence, thus creating a compression effect at the entry point. 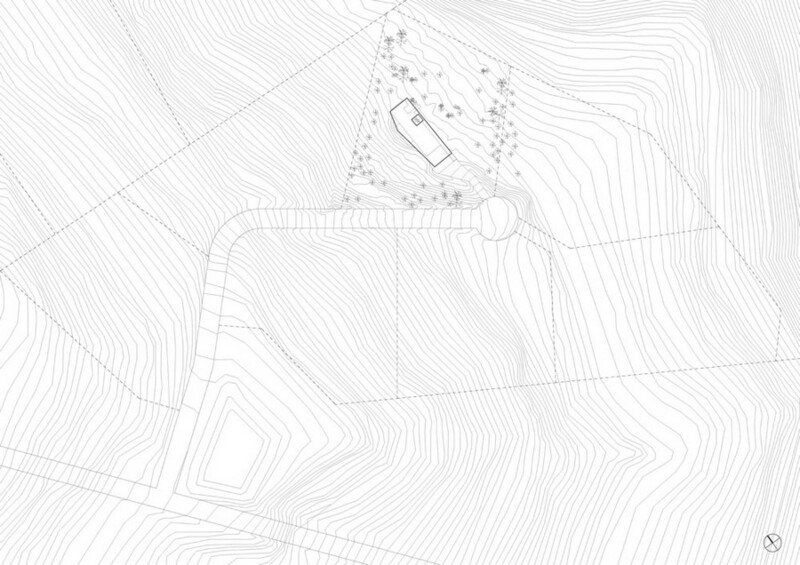 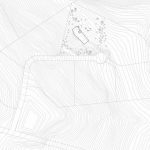 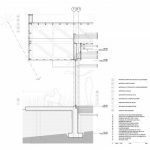 This longitudinal access participates to the discovery and entry processes, orchestrated with the intent of slowly revealing the exceptional qualities of the site. 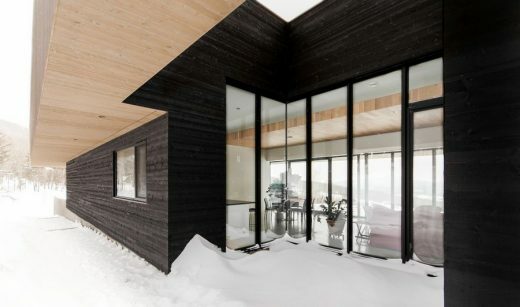 Like a bite taken in the layout, the totally glazed interior courtyard allows transversal transparency and is giving to the owners the opportunity to fully experience a privileged contact with the mountain. 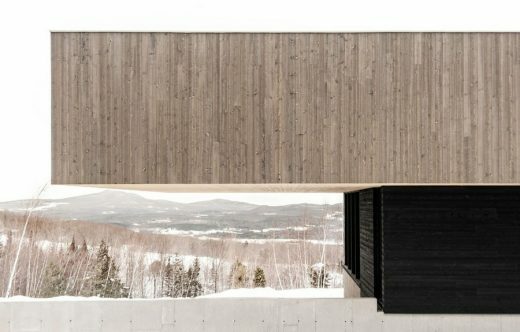 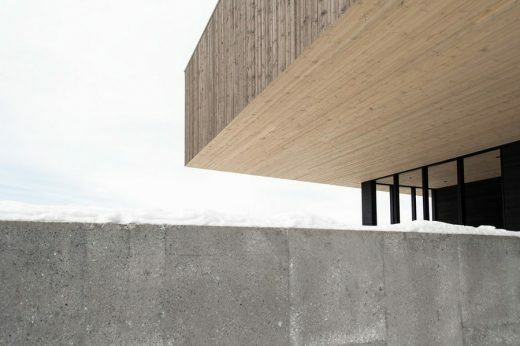 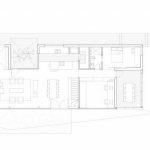 This connection between built space and exterior space contributes to enhance the spatial quality of the main living area by integrating within the house a fragment of the mountain. 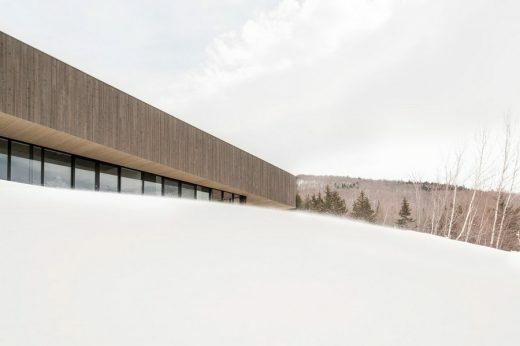 The design aimed to bring the qualities of the eastern township’s natural and built landscape into the architecture of the house in order to create an appropriate and responsible insertion of the project in its actual context. 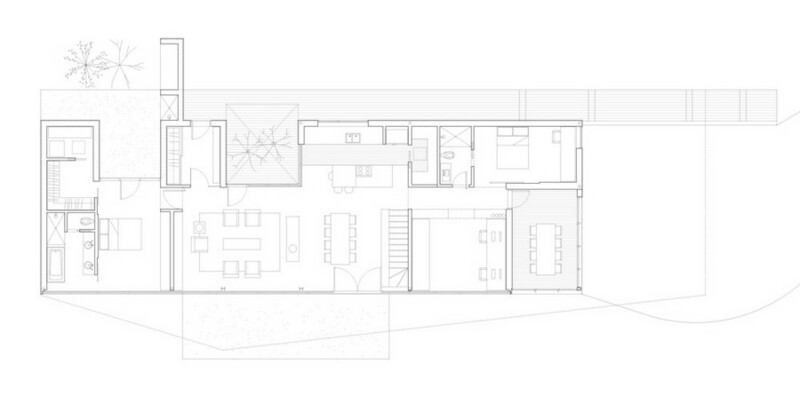 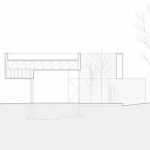 The residence is low and outspread, its shapes, colors and its materiality are directly inspired by the site. 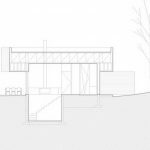 From the beginning, the objectives were to create a residence that seems to emerge from the ground and that was built with materials found on site. 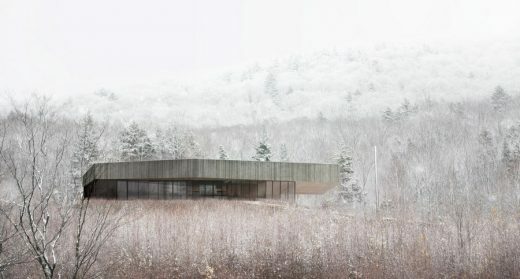 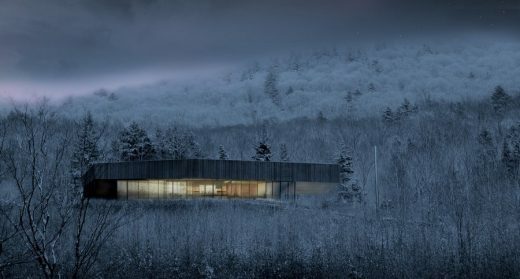 Ultimately, the volumetric and material integration of the residence relies on visual integration and trying to preserve the quality of the surrounding landscapes.